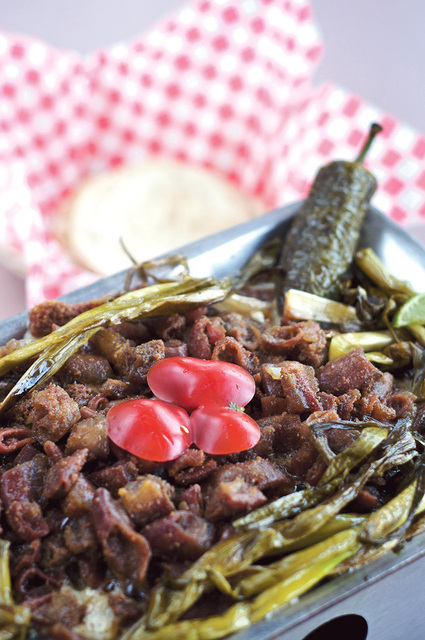 The tripitas , served with with grilled green onions and jalapeño peppers, become increasingly crispy as they cook. Alambre is akin to fajitas with cheese on top. The dining room has seven or 10 tables, depending on how many are pushed together. Dormant for the moment, eight ceiling fans hang at the ready for a busy summer—the small restaurant is surrounded by asphalt in the parking lot of a grocery mercado on Isleta, just east of the sharp bend at Goff and Arenal. My first time there, I watched a family leisurely work on little pieces of meat sizzling on an 8-by-6-inch sterno-heated tray. The meat became increasingly crispy as the teenage daughter, clad in crazy leg warmers, wandered the tiny dining room on her phone. The tray was garnished with grilled green onions and jalapeño peppers and served with fresh tortillas and several salsas. I asked the waitress what they were eating. I didn’t have the cajones to order some for myself. I don’t like menudo, so if tripitas are little pieces of tripe, the chances were good I wouldn’t like them, either. I’d feel silly if I ordered that enormous tray and barely touched it. But they looked delicious. I vowed to return with qualified reinforcements. In the meantime, I had ordered alambre, a dish that’s similar to fajitas. I sipped an enormous glass of fresh-squeezed carrot juice as I waited. The family got up; mom filled a takeout dish with every last morsel of tripita and garnish. “These are better than at the bus stop in Mazatlán,” said the kid who works at the morgue. The alambre was beautiful. A row of small corn tortillas peeked out beneath diced, browned beef and sautéed red and green bells and onions, all of it covered in white, stringy cheese. Sweet and creamy pintos and rice with slivers of carrot came on the side, as did a ranch-drenched salad of cucumber, tomato, lettuce and avocado. I finished with a glass of horchata, freshly made and gritty on the bottom. As the days went by, I kept thinking about those tripitas. In the midst of an EMT course one Sunday, after a morning spent observing the ventilations of a set of pig lungs, our instructor said we’d get an extra-long lunch break. “Tripitas?” said the kid who works at the morgue. It wasn’t long before the kid who works at the morgue was sitting next to me in a corner table, awaiting our tripitas. He drank a cup of champurrado—a hot, sweet, thick drink made of atole cornmeal, chocolate, milk, clove and cinnamon. I sipped a fresh-squeezed orange juice. The tripitas were as beautiful up close as the ones I’d lusted after. Half-inch-long meat cylinders were textured and perfectly chewy, with an exterior crisp that kept crisping as we worked our way through it, filling three-inch tortillas with salsa and meat. They tasted clean and bacon-like, without the gamey flavor of menudo. They were amazing. As they cooked, layers of fat—mesenteric fat, said the kid who works at the morgue—melted, and the tray would occasionally launch a drop of grease splatter. Eyewear is recommended. I looked inside one of the tubes and noticed some pink, grainy, creamy tasting material. When I asked the waitress where the tripitas were from, she surprised us by saying cow. (“They’re too small for cow,” the kid who works at the morgue had assured me.) They were so baconny I had assumed I was eating pork. The waitress continued talking about them, in Spanish; I didn’t really follow, something about “leche de vaca” and baby cows. Only later, with the help of the interweb, did I put it together that “tripitas de leche” refers to the marrow gut, an organ in un-weaned calves that connects two of their stomachs. When the calf switches from milk to grass, the marrow gut hardens and becomes inedible. That explained the delicate, clean flavor and dreamy, tender texture. It was easily the biggest and best $11.95 veal lunch I or the kid who works at the morgue had ever had.